io9 March Madness Elite Eight: Lord of the Rings vs. Game of Thrones! We're down to our last eight competitors in our search for the greatest work in all of science fiction and fantasy. So now it's time for you to vote on today's batch of titanic match-ups, as Star Wars takes on Firefly, Doctor Who battles the X-Men, Lord of the Rings crosses swords with Game of Thrones, and Harry Potter fights Buffy! Top image: CallMePo and SickSean. All four polls are now open and can be found at the bottom of the post. They will remain open until midnight Pacific time tonight, so VOTE NOW and help guide our tournament further into the depths of March Madness! As always, you can go here to get a refresher on the tournament's rules, and our updated (and corrected) bracket is below; click here for the biggest possible version. Last Friday featured some very close match-ups in the Sweet Sixteen, particularly in the Magic & Monsters regional. We only just avoided breaking out the decimal points in Buffy the Vampire Slayer's come-from-behind, 51-49 victory over the Dread Lord Cthulhu, while Harry Potter finally ended 14-seed Hellboy's inspiring Cinderella run with a 54-46 win. But that still leaves 13-seed X-Men, the sole survivor of the opening play-in round, which cruised to a 63-37 victory over Terminator over in the Dystopia & Mad Science Regional; meanwhile, the epic battle between Doctor Who and Blade Runner saw the Time Lord emerge triumphant, 53-47. Over in the Space Opera regional, Firefly knocked off The Hitchhiker's Guide to the Galaxy, 53-47, in what the last of the day's close match-ups. The other three contests were all routs: Star Wars took down Dune 71-29, while the Epic Fantasy regional delivered us the only match-up of 1-seed and 2-seed as Lord of the Rings beat The Princess Bride 71-29 and Game of Thrones notched the most convincing victory of the Sweet Sixteen with its 75-25 defeat of the plucky underdog Highlander. This defeat of the immortal Scotsman really shouldn't come as much of a surprise: If there's ever been a fantasy franchise that you can count on to behead a beloved hero without mercy or pity, it's Game of Thrones. Today sees the Elite Eight, in which our competitors face off for a chance to win their chosen regional. 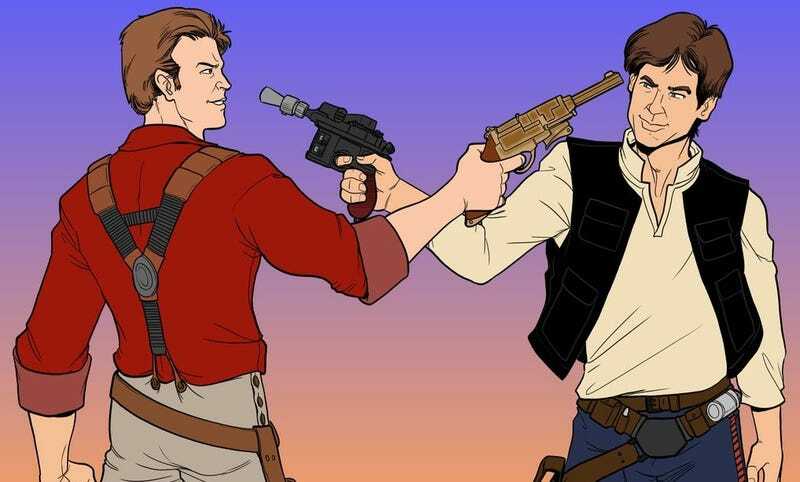 Star Wars and Firefly vie for Space Opera supremacy; honestly, if we could settle this with the pictured duel between Han Solo and Malcolm Reynolds, we would, but your voting will have to do. Over in Epic Fantasy, Lord of the Rings and Game of Thrones is the one showdown that probably everyone could have seen coming from the very beginning, so we await the coming brutality with great interest. In the Magic & Monsters Regional, Harry Potter has emerged as the standard bearer for magic, while Buffy the Vampire Slayer is on hand to represent the monsters (which, to the best of understanding, she then slays). And our Dystopia & Mad Science Regional delivers us a final that tilts more toward the Mad Science side of things, as Doctor Who and the X-Men fight for the last spot in the Final Four. The only ones who can decide our Final Four are YOU, so VOTE NOW. Our polls remain open until midnight Pacific time tonight! And be sure to come back on Wednesday in which we decide which of our four regional champions will advance to Friday's championship battle!